Last Thursday, a bundle of tightly closed freesias came home with me from the grocery store. After trimming the stems, I plopped them into a vase and waited. My wait has been rewarded by creamy blossoms gradually opening to release the delicate, fresh scent of early spring. Here's another photo, taken a few days earlier, by the light of a little lamp in the morning. We're doing some planning for the kitchen renovation that is going to take years, not months. First step was the fireplace we installed last autumn. Next will be trading out the sliding glass doors for a single hinged door, and installing a window on a blank wall. To that end, we taped off the size of the window and moved the breakfast table in front of it. Since there's nothing to see and no light there, the little lamp adds a cozy ambiance. On Saturday, we helped some friends move, and Tim also helped do some minor repairs to a "new-to-them" first home purchased by our children. My task for the day was providing lunch for the gang. I set up at our eldest daughter and her husband's home, since it's closest to all the activity. Our three grandchildren were there, as well, and the wooden train set is a favourite of Mr. F, now almost 4. The two girls ran around playing "hotel" and making tickets for us all to check in. When it was time to go home, Mr. Bear apparently wanted to spend the night at Nana's house, so he came along. I assured Miss S that he would have a good time and took some photos of him reading (Mrs. Tiggywinkle), sleeping under a cozy quilt, and eating berries, nuts, and yogurt for breakfast. He's home again now, and Miss S used her mother's camera to take a photo of him playing Lego, and shared it with me on Facebook. This afternoon, Sunday, Tim and I went for a long walk. Although the wind was chilly, warmth from the sun heated our backs, and the sky was blue, blue, blue. Such a welcome sight. Brighter skies, brighter days. Hooray! Oh, I shall buy some freesias soon. They are such a sign of spring. I loved the blue sky today. It sounds like you had a lovely weekend. We are having some warm weather here in Southern California, but your freesias made me smile. So lovely. I'm sure those pretty Freesias made our home smell lovely! How nice Mr Bear had a fun sleepover--loved those photos! Your kitchen renovation plan sounds interesting. We have a long list of renovations we have to do at our home, also, a little at a time as money and times allows. Have a good week, Lorrie! My daughter in law brought me some pale lilac Freesias well over a week ago, and they have given me such pleasure. Mr Bear obviously enjoyed himself! We had beautiful blue skies yesterday, long may they last. Such a fun sleepover, made me smile. The freesias are a delight. It would be grand to have a bit of sunshine here. It's been a cold and gray weekend. you freesia blossoms offer the hope of Spring! Thank you! I love that you were entrusted with caring for Mr. Bear. I know how hard it is for kids to part for a favorite stuffed animal so you should be proud. Love the Teddy mosaic, he looks so happy reading about Mrs T and all her friends. Look at the gorgeous blue sky, love days like those, have a great week and happy MM. Thanks for sharing your beautiful flowers. Im always dellghted to read posts about grandchildren. Im still in the grandchild group - a five year old girl so far. I love freesia! I bet Mr. Bear had a wonderful time and will be giving a complete report -- too cute! The freesia are sweet and a welcome sight. The delicate scent from fresh freesias is a great favourite of mine, but strangely I do not like freesia perfume - the makers just don't get it right. I don't envy you doing the kitchen - we had ours done last year - it is hard at the time, but worth it in the end. We were just commenting that even though it's really cold, it looks like spring with brighter, longer days and greener grass and daffodils starting to pop up --- but there is more winter to come most likely. 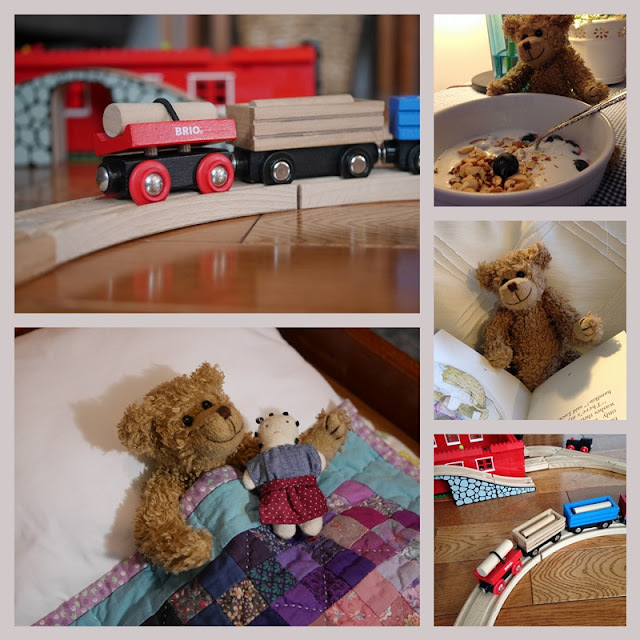 How cute that Mr. Bear wanted an overnight at Grandma, and you documented it so nicely. Spring won't be seen in Ontario,for another 6 weeks, so I will treat myself to some Freeshia. I love the scent, wafting through the house. What fun to have "Bear" stay the night. He looks like a very well treated guest, with all the comforts of home and more. What fun to share photos with his concerned "Mommy". I can smell the freesia from here .... hmmm. I think I would like to have a sleepover at your house if Mr. Bear's hospitality is anything to go by! Hoping you have more sunny days this week! How fun to play with bears and also be planning more renovation in your kitchen. Oh!!! I can almost smell the flowers. They are just gorgeous! I need some flowers in my house right now. Your freesias are pretty. Bringing flowers indoors is a wonderful way to decorate especially in cold seasons. I find enjoyment in kitchen renovation, even it is hard and takes years!It is fun. Love to hear the story that your family helped your friend's move. I love the perfume of freesias. And I also love that you took the bear home, and took photos of him. It is lovely to play along with our grandchildren's games and not be so "grown up", Have a lovely week and thank you so much for stopping by my blog last week. Freesias and blue skies ... they bring joy! Oh those freesias must have smelled heavenly. I think I may pick some up at the market next time. It's almost time for primroses around here...and cut daffodils. We have plenty of winter yet though. Such pretty flowers! Mr. Bear's cute photos made me smile. We're expected to receive another 5-10 cm of snow tomorrow, but the longer days are giving me hope that spring is on its way! I'm sure you have enjoyed the fragance! Ohhh, my favourite scent. I can smell their perfume now. Your freesias are beautiful ... Mr. Teddy is surely enjoying himself and looks quite content in your picture mosaic...What book is he reading? I’ll definately be glad when the snow is gone... but hey we just had a big snow storm with freezing rain... so I guess ..I best snuggle in with teddy and a cup of tea. Thanks for sharing . I've never seen freesias in person! They're lovely! Your kitchen changes sound so exciting and probably a great idea to spread them out over time, with periods of getting your life back to normal between. Mrs. Tiggywinkle is dear to me because I took her along with me for the births of my last two sons. Her little face was my focal point during labor! So cute that the bear was sent home with yoU!!! Lorrie, sounds like good times! Thank you for reminding me about freesias - one of my favorite flowers, and yet they've slipped off my radar for several years now! Love the collage of Mr. Bear having a good time. That blue and sunshine in the last photo must have been a welcome sight for sure. Sounds like we might finally get a string of dryness soon! Love the freesias. So glad you saw some blue skies over there. Long overdue!